How does a charity develop a strategy that feels relevant to all its members, volunteers and staff? A mission that everyone in the organisation feels committed to? How do you get all your internal stakeholders on board if you represent a diverse body, with members spread over the UK? These were some of the challenges facing us at NCT (National Childbirth Trust), the UK’s largest charity for parents, which supports millions of new mums and dads through their first 1,000 days. We’re a large organisation with over 5,000 volunteers in our network of branches, 1,000 plus self-employed practitioners, and numerous counselling and peer support schemes. NCT has been around for over 60 years with a proud history to build on but we needed to modernise, both from an infrastructure point of view and in terms of how we engage with and deliver services to parents. Basically, we needed to come together to renew our sense of common purpose and agree our direction for the future. We set up 30 roadshow events across the four nations, called Common Purpose workshops. These gave our staff, practitioners and volunteers, a scattered audience, the chance to discuss their vision with the leadership team and agree our core goals for the ten years ahead. Almost 500 people attended the workshops – from Aberdeen to Exeter, and Belfast to Norwich. Thousands of perspectives and ideas were shared which led to umpteen conversations about what was working at NCT and what needed improving. We realised there’s a lot of truth in the saying, ‘If you want to go fast, go alone, but if you want to go far, go together’. The whole organisation had to be on-board. If our volunteers, practitioners and staff built the strategy, they’d be much more likely to get behind it and make it work. The roadshows were extremely useful and an excellent way of getting lots of interesting feedback. We had loads of brilliant ideas but we had to be realistic rather than building castles in the air. One of the challenges of asking hundreds of people for their thoughts is you’re bound to get some doable and some harder to achieve suggestions. Another obstacle was the logistical challenge of putting on events everyone in the organisation could attend. One of the ways we dealt with this issue was by putting videos of the workshops on our website. You can see the latest one here. As well as gaining input on the new strategy, we also collected so much useful data about the challenges our volunteers and practitioners face at grass-roots level and discovered some excellent and innovative ways they are working with new parents. It took time to wade through the thousands of flip-chart pages and post-it notes, translating the numerous ideas into realistic, costed plans. 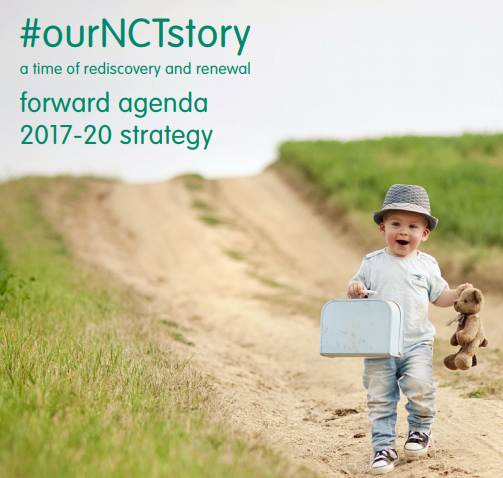 After several months of hard slog, NCT’s Forward Agenda strategy was produced. We opted not to work with an agency. Instead, the senior leadership team, who had been listening intently to our staff, practitioners and volunteers, boiled down the thoughts and feelings of our community into a coherent strategy. Among a wide range of ideas and opinions, there was overwhelming support for the mission to support parents throughout the first 1,000 days to have the best possible experience of pregnancy, birth and parenthood. Much of the research supported our assumptions, telling us we were headed in the right direction. We also picked up detailed insight into the rich variety of support we offer to parents. When surveyed, 92% of members said they supported our renewed vision, mission, strategy, and core goals, so we knew we were on the right track. The workshops were such a success we’ve decided to run these events annually. It was clear from the enthusiasm at the first workshops that people believed in the strategy and were keen to be involved in bringing it to life. We want to keep hearing ideas and checking in on our collective progress. It’s an effective way of holding ourselves accountable to staff, practitioners and volunteers. Originally a one-off piece of work to gather wider input, the roadshow has fundamentally changed the way we engage with our internal stakeholders. More than that, it is now vital to our annual planning process. One of our challenges is managing the pace of the work we’ve set out on. We need to continue delivering the work we’re known for, supporting parents-to-be and new parents, while strengthening the organisation and growing at the same time. I’m pleased to say we’re already making good progress on the first year of the plan. Looking ahead, our sense of common purpose will determine our movement toward our ambitious goals. Can you change a man like Homer Simpson? Sam is executive director of communications and development at NCT and looks after the brand, communications, campaigns and partnerships. She joined NCT in 2016 from youth charity, London Youth, where she ran operations. She is from Barnsley and the mother of three boys.